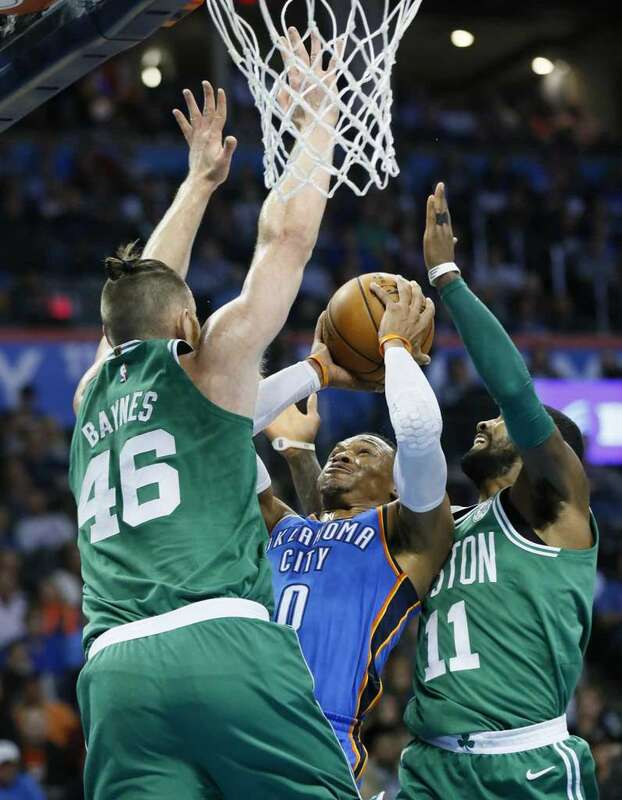 The Boston Celtics’ Friday night, nationally televised tug-o’-war with the Oklahoma City Thunder and their new Big Three was advertised as a match-up of two of the young season’s better defensive squads. In that regard, the game did indeed deliver – each team offered us 24 minutes of exquisite play during which it allowed the other guys to convert a mere 18 of their 47 possessions (a 38% rate of conversion). During the first half, Billy Donovan’s boys throttled the C’s to the tune of 31% FG shooting and eight Turnovers in forging an 18-point cushion. Kyrie Irving’s flat earth seemed fraught with pot-holes as he and his team struggled mightily to establish any offensive rhythm. They even seemed to lose their new-found stroke at the foul line, missing four of 10 tries. 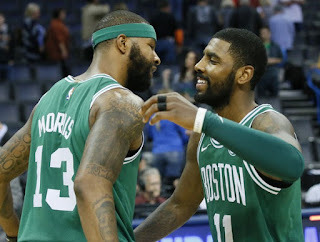 There’s a funny kind of synchronicity to basketball – good, aggressive defense quite often leads to easy scoring opportunities; and well-executed offense (preferably a successful shot) tends to be the best Prelude to a “Stop” … and vice versa. Well, Coach Brad’s soon-to-be-famous Half-time Houdini session again versaed his team’s first -half vices. First Jaylen Brown’s shooting stroke returned as Boston fashioned an early Q3 run of eight conversions in nine possessions. Simultaneously, the C’s also soon-to-be-famous D was recording 16 stops in the Thunder’s 24 quarterly possessions. The Celtics hadn’t caught up when Q3 wrapped up – that would require a dozen more possessions – but Momentum had certainly shifted corners in this scrap. 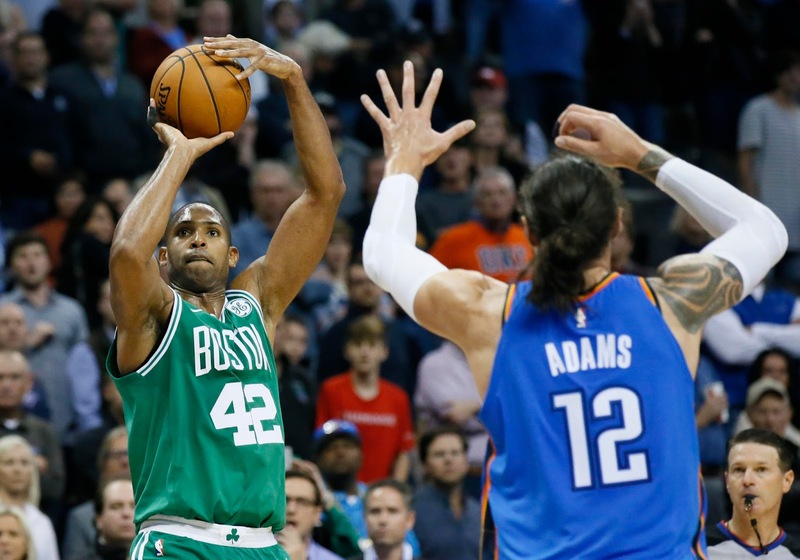 Irving also got shed of his clumsiness in Q3, and his rediscovered jitterbug seemed to invigorate dance partner Al Horford, whose clutch Q4 marksmanship repelled OKC’s final parries. 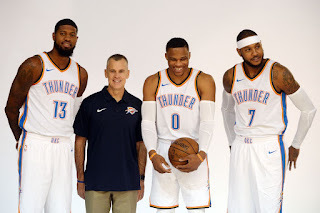 The Green Defense was so stingy in Q3 that OKC managed back-to-back conversions only once during that 12 minutes of play. Stat of the Night: After kicking the ball away with eight first half TO’s, Boston committed but three miscues thereafter. Carmelo Anthony did both me and Jaylen Brown a good turn last night when he was charged with a lane violation on a JB missed FT in the third quarter. The sophomore stud’s shaky FG% was aided by making the substitute FT … and I learned that, in such a case, the shooter is not charged with an FTA. It’s similar to how things work when a player is fouled in the act of shooting – he’s credited with both a make and an attempt if the shot falls, but does not get charged with an attempt for a miss. … now if someone could just explain to me the reasoning behind how Turnover Percentage is calculated.